IS THE AUSSIE FOR ME? A BREED APART In the dog world, the Australian Shepherd is considered one of the most versatile breeds today. Although their origins are clouded and some believe they came from Australia, while others believe they came from Spain. What is known is that the cattle ranchers and sheepmen of the Western United States played a major role in the history of the Aussie. They recognized the Aussies value as a versatile working dog. As times changed and the children of these ranchers and shepherds grew up and moved away, they thought back to the faithful blue dog of their childhood and returned to the country in search of the dog they grew up with. This is when the Aussie's true versatility and unusual characteristics began to show. The Aussie, though a silent worker, is very vocal when playing with other dogs. When greeting their owners or upon being praised they will often make a singing noise, speaking to you in various tones ranging from a deep howl to a shrill whine. This vocalization may or may not be accompanied by the dog carrying a favorite squeaky toy in it's mouth. Some Aussies have the tendency to "grin", (not to be mistaken for baring their teeth) when feeling silly or goofy, while others routinely sleep with their front paws crossed. Some Aussies snap their teeth together making a clicking noise when they are happy. They are renowned as a nudge to get your attention by using their nose to push up under your arm or hand or by bumping you on the back of your leg as you walk. The Aussie is a very clean dog that enjoys spending time grooming themselves and others. A mother Aussie will clean her puppies at great length and, because Aussies are so clean, they are easily housebroken. Aussies are quite handy in using their front feet often amazing you with their abilities. Watch an Aussie during play, while chewing a bone or grooming itself to fully understand. Water and Aussies are usually a winning combo. Whether you have a pond or stream nearby or are like me and have a kiddy pool or hose, rest assured most Aussies will take advantage of the opportunity to get good and wet. Some will chase after the stream of water from the hose or actually lay in the kiddy pool to cool off. Fortunately, their coat is wash and wear. A good shake or two after drying usually leaves them acceptable for house living again. Please understand, Aussies DO shed and DO require some brushing although they normally do not matt and tend not to collect debris from walks in the woods of fields. A playful and jovial dog, the Aussie is a natural athlete excelling in agility. They can leap straight up and down like a yo-yo and scale a fence like nobody's business. Frisbee and ball fetching are favorites! You will be amazed at their antics. These dogs are very social and have been bred for their ability to work with other dogs. Known as the Velcro dog, being extremely loyal is in their nature. Get ready for a dog that follows you from room to room each time you get up. Watch your step when you leave the shower, chances are there will be a dog laying at the shower door. Unhook the doorbell, there is normally no longer a need for one! The Aussie will let you know when someone arrives. Without proper training and socialization some Aussies can become overly protective. Please remember the roots of the breed. These dogs have a herding instinct whether it comes from strong working lines or show lines! Children, cars, bikes, are all fair game for an untrained dog. A good foundation of obedience training is a MUST! No exceptions!!! The Aussie is by far one of the most intelligent dogs in the world. They are loyal, protective and willing to please beyond belief. They love and protect children and or other perceived family members. With their bobtails and medium size they make an excellent house companion. After reading this please be honest and ask yourself, "Is an Aussie really for me?" 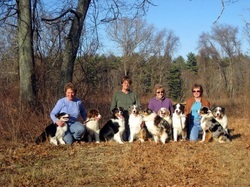 Australian Shepherds are generally a healthy breed. When purchased from a reputable breeder you should expect your puppy will be the offspring of parents who have been examined annually by a certified licensed ophthalmologist for eye defects and rated by O.F.A. for hips clear of Hip Dysplasia. A well-socialized puppy raised in a clean and open environment is worth its weight in gold! Bargain puppies often have unforeseen problems which can result in expensive veterinarian treatments far exceeding the initial cost of a well bred puppy. Have a frank discussion with your breeder about these and other health issues such as Epilepsy, Cataracts, Thyroid Irregularities and Autoimmune Diseases, which can crop up within the breed. Of great concern is the newly discovered MDR1 Sensitivity Gene. If your veterinarian is unaware of the issue it is up to you to educate him/her! A simple cheek swab DNA test is now available to determine if your dog is n/n, m/n or m/m. Once you are aware of your dogs status it is not a problem to live with a positive dog because alternative medicines and reduced doses are options however be forwarned if your vet is not familiar the posibitity of overdoses and toxic reactions can be fatal. Here at Harmony Hill, all puppies leave with the proper written information along with the cheek swabs to test your puppy. Be sure to hand the info provided to your vet. Puppies born here at Harmony Hill are raised amid the hustle bustle of my sons, their friends and now grandchildren. They are kitty proofed by our Ragdoll Cats, go for car rides and become acclimated to the crate prior to moving on to their new homes. The temperament test is administered at 49 days as a breeder reference tool for the proper matching of puppy to prospective owner. Considerable time and effort go into our dogs. Our breeding program has a strong emphasis on temperament first and foremost, the rest follows closely behind. Expect to pay $2,000 for a well bred companion puppy. In the event a young adult is better suited for your family inquire about availability as we sometimes have adolescents or retired show dogs priced according to level of training. Prior to contacting Harmony Hill Australian Shepherds regarding availability of puppies, please take a few minutes to answer the questions in the Puppy Placement Questionnaire.